Doreen has over 30 years of experience as a licensed physical therapist. 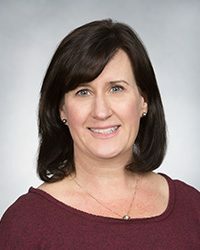 She graduated from Quinnipiac University in 1989 with her Bachelor of Science degree in physical therapy and moved to San Diego where she started her career. Doreen has a diverse background in physical therapy with emphasis in manual therapy. Her clinical experience includes sports and orthopedic rehab, prenatal and postpartum rehab, work with seniors and osteoporosis, and much more. She has been teaching Pilates for 17 years, and has found that it is an invaluable tool for integrating awareness and facilitating the body’s innate ability to heal through movement. Doreen especially enjoys helping patients with back pain through an exercise system she has been developing over the past several years in her Pilates practice. Doreen owned and operated Pilates People with her husband Dave Hall for 15 years. She completed the Polestar Pilates training in 1998 with Brent Anderson and Elizabeth Larkam and continues to explore the use of the Pilates principles in all her treatments. She enjoys the diversity of working with clients of all ages to improve their quality of life.